Butterfly Conservation is a non-profit making company limited by guarantee, registered in England (2206468). It is also a charity registered in England & Wales (254937) and in Scotland (SCO39268). Butterfly Conservation Scotland can be contacted at Balallan House, Allan Park, Stirling FK8 2QG, Tel 01786 447753. 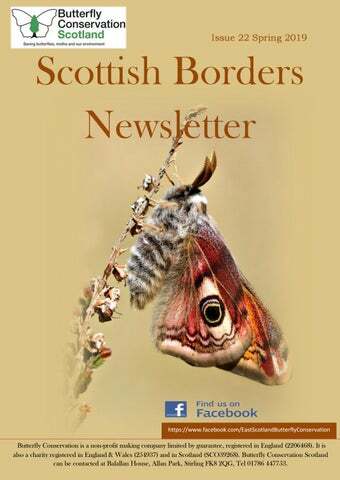 Welcome to the latest issue of our newsletter for Butterfly Conservation members and many other people living in the Scottish Borders and further afield. Please forward it to others who have an interest in butterflies & moths and who might like to read it and be kept in touch with our activities. 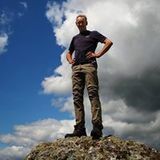 Iain Cowe iainacowe@gmail.com Welcome to the Borders Newsletter for Spring 2019. I will start by introducing myself. My name is Iain Cowe and I am from Chirnside in Berwickshire and only a few years ago took on the role of Scottish Borders Butterfly recorder. Butterflies had never really figured throughout most of my life but I did start to dabble about 2004 and 2005 culminating in my rediscovery of the lost Small Blues on the Berwickshire Coast in 2007. Since then I have never really looked back and am now hopelessly addicted to Butterflies. I was always very lucky that my interest was kindled at roughly the same time that Barry Prater arrived in the Borders and became Chair of the East Branch. Barry’s enthusiasm and leadership reignited the Scottish Borders scene that had already in place some fantastic experts across the region as I was to find out. I have been inspired by the likes of Malcolm Lindsay, David Long, Ron McBeath and Michael Braithwaite all experts and leaders locally and nationally. I was also much encouraged by the writings and discoveries described within the journals of the History of the Berwickshire Naturalists Club by Albert Long and George Johnston among many others. I have learned that discovering my local area is an often very pleasant, never-ending journey. I have come to understand that I won’t ever know all there is to know within the region that concerns our Butterflies, yet I see that now as a positive and not a negative. We all have time to shed a little light while we are here, and our hope is that others can pick up the torch after us. Many thanks to Barry for editing this Newsletter this past 10 years, and 21 issues, quite a feat. I don’t know if I can go 10 years and 21 issues….we will see. Hopefully you find the Newsletter as enjoyable and as interesting as ever. T shirts, shorts and sandals are not items worn that are usually associated with February in Scotland, yet in late February 2019 we suddenly found ourselves contemplating summer attire as temperature rose towards 20oC across the branch area. For a good week or so the world of winter was turned upside down when high pressure over the Atlantic fed an unusual plume of warm sub Saharan air north towards the UK. This tropical air had a profound effect on our Lepidoptera as gradually evidence of some remarkable early records began filtering in from recorders around the country. There were records of unusual movements of migrants we normally see in late May or June, Red Admiral and Painted Lady being very visible examples. Our native Moths began getting jumpy as well with several very unusually early records for Hebrew Character, Clouded Drab, Common Quaker and Red swordgrass. As for native Butterflies, no less than 4 species were recorded that included, Peacock, Small Tortoiseshell, Comma and Small White. These records so far are the ones we know about, and no doubt we will hear about others as the season progresses. On top of all these discoveries, during the warm February spell, Ken Haydock and Jill Mills unearthed another site for the White-letter Hairstreak on the Kale and noted that this yearâ&#x20AC;&#x2122;s eggs were in the throes of hatching out! Nick Cook writes about a chance discovery of a very rarely seen Scottish Moth. "A few years ago I gave a talk to the Minto WI on the subject of "Moths", a lifelong interest of mine which involves running a moth-trap in my garden at Denholm Mill. As a result of that talk I receive quite a few enquiries from villagers who have found unusual insects or caterpillars in their gardens that they would like to have identified. On 20 November I received one such enquiry from Sheila Marshall who lives at Elmbank, Kirkside Following my talk to the WI Sheila had bought a guide book to the moths of Britain and had used it to identify a moth that she had found in her house. She arrived at my door with the moth (in a plastic Chinese take-away carton!) with the words: "I think it might be a Golden Twin-spot". In my 55 years of recording moths I have never seen a Golden Twin-spot!! At first glance it appeared that Sheila's identification was correct. However as this was a new species to me I sent photographs to three experts for their opinion and verification. One of those experts came hot-foot to Denholm from Newcastle to see the moth in the flesh because it turns out to be a real rarity. Three of the four of us agreed that Sheila's moth is indeed a Golden Twin-spot, and a scientist from the University of Aberdeen is still thinking about it! This would be only the third record of this species of moth being found in Scotland. I went to Sheila's house to report the news and to ask her where it was found. "Inside the dining room windowâ&#x20AC;? came the reply. My next question surprised Sheila. "Do you have any Kiwi fruit in the house?" and low and behold, here was a bowl of four fruit in the same room! My hunch was that this moth, a native of Southern Europe and the Canary Islands, could have hitched a lift with the fruit, on which its caterpillars are known to feed, and can become a greenhouse pest in its home countries. The story of the discovery of this rare moth brings us full circle. Sheila's house, Elmbank, was previously the Cameronian Chapel in Denholm where lived one James Duncan (1803 1861) who is buried at Cavers Auld Kirk. Duncan was an expert on moths in the early nineteenth century, and published one of the first books on British Moths in 1836. He would have been delighted to know that such a rarity turned up in his old home, over 180 years after publishing his book! The work of County Recorders is made a little easier if records are sent in from time to time during the year rather than all together at the end. The Borders County Moth Recorders: Peeblesshire: Reuben Singleton, 5 Frankscroft, Peebles, Scottish Borders EH45 9DX reuben@dukehaugh.free-online.co.uk Tel: 01721 723858 Selkirkshire: Malcolm Lindsay, Burn House, Mossilee Road, Galashiels TD1 1NF malcandles46@talktalk.net Tel: 01896 753425 Roxburghshire: Malcolm Lindsay, Burn House, Mossilee Road, Galashiels TD1 1NF malcandles46@talktalk.net Tel: 01896 753425 Berwickshire: Barry Prater, 12 Barefoots Crescent, Eyemouth, Berwickshire TD14 5BA barry@prater.myzen.co.uk Tel: 018907 52037 & the Borders Butterfly Recorder: Iain Cowe, 6 Lammerview, Chirnside, Berwickshire TD11 3UW bordersbutterflies@eastscotland-butterflies.org.uk Tel: 01890 818314 or 07775 747838 There is guidance on submitting your butterfly and moth records on the branch website and also some recording forms which you can use - these help enormously when collating all the records. Heralds and Tissues in winter Katty Baird summarises the results of another winter’s study of the hibernating habits of some of our most remarkable Moths. The third winter of the Hibernating Herald project has ended. Three winters now clocked in pursuit of finding, following and documenting overwintering Heralds and Tissues in some of Scotland’s darker places. I am slightly reluctant to admit that from August until April I probably spend (on average) a couple of days a week seeking out these two species, often revisiting the exact same sites with the exact same moths… surely I must be getting bored? Sometimes, of course, yes and at times it can be a bit of a motivational effort. But the possibility of seeing new behaviours, finding other creatures and occasionally crawling in newly discovered culverts, seems to be good enough for me. In fact, getting to know individual populations of Heralds and Tissues in more depth has massively enhanced my enjoyment of moths: I still get a big buzz when I see a Tissue, even if it is one I already know. The Hibernating Herald project should be reasonably well known now, but for those needing a refresher on what it’s all about there are details on the East Scotland Branch website under ‘surveys’. In this article I thought I’d share a little of what the project has been discovering on the ecology and behaviour of these moths. Much of this has been gleaned from the caves, culverts and mines of Berwickshire (see map for locations). Tissues (Triphosa dubitata) Numbers: A key finding is that the Tissue is not as scarce in Scotland as once believed. In each of the last two overwintering seasons we have recorded around 100 individuals (almost entirely in Fife, the Lothians and Berwickshire). Counting has been helped by the moths having a unique pattern on the forewings which enables individuals to be recognised. For example, in one tunnel in Cove, the most seen on a single visit last winter was 10; but photographing individuals found on each visit show that 25 were actually recorded. Activity: Tissue activity and numbers peak in September (and this is the best time to go looking) as the moths come together in caves and tunnels to mate. By the end of Octobers numbers are much diminished and only a handful of females remain. We think perhaps the males keep moving on to new sites, searching for more females to mate with, until they ultimately perish. They certainly show much more sign of wear and tear than their more sedate female counterparts. Females remain in their shelters, though some possibly move on to smaller cracks and crevices to pass the winter, undetected by me! Although nearly always found sitting motionless on walls, the overwintering moths must maintain some activity as they are rarely seen in the same spot on each visit to a site. The reason for this is unknown. Not only will moving use up valuable energy reserves, it also makes them more vulnerable to predation. This was evidenced in Cove this winter, when I found a neatly packaged Tissue in the web of a cave spider. Spring time: Tissues head out to take their chances with egg laying in April. The most often-quoted food plant is Purging Buckthorn Rhamnus cathartica but records of this small tree are extremely unusual in Scotland. Blackthorn and Bird Cherry are also sometimes mentioned in texts, which seems much more plausible up here. We just need to prove it! Heralds (Scoliopteryx libatrix) The Herald is a much more widespread moth than the Tissue in the UK. It could even be classed as â&#x20AC;&#x153;commonâ&#x20AC;?. Is there anything new or interesting to discover about it? The Herald: Surely one of the UKâ&#x20AC;&#x2122;s most beautiful moths? Numbers: Although the Hibernating Herald project hasnâ&#x20AC;&#x2122;t altered the known distribution of Heralds in Scotland, it has found them to be much more numerous. We have recorded over 2700 individuals per year of the project, compared with an average of just 100 per year in the National Moth Recording Scheme from 2000-2015. Searching for them in dark places is more productive than light traps or sugaring, and arguably much more fun! Activity: Heralds start to arrive in overwintering shelters in late August and continue to arrive until almost the end of November. To start with there is some movement of moths within their shelters, but within a couple of weeks they have settled down and generally remain in exactly the same position all winter. However, they are not sleeping so deeply that they canâ&#x20AC;&#x2122;t rouse themselves in an emergency. In an old Penmanshiel culvert some Heralds had chosen to rest under a collapsed bit of floor. Nice and safe from the very real risk of marauding Wrens, but not so good when the culvert inevitably flooded following some heavy rain. Although not all the Heralds survived this flood, the majority relocated to the ceiling of the culvert and have remained high and dry for the rest of the winter. Under this culvert floor was a well-hidden spot for Heralds to hibernate. Until it was flooded with water. Luckily most relocated to the culvert ceiling and survived. Site choice: We have struggled to characterise what makes an ideal overwintering location for Heralds. In the south east of Scotland they seem to use almost anywhere that is sufficiently dark and sheltered and we have had very few zero counts in likely-looking places. Surrounding habitat is likely to be important, and as long as there is the larval food plant of willow or poplar in the vicinity of a dark place there are likely to be overwintering Heralds housed within. However, they do make bad choices. In a few sites Heralds have arrived and settled in reasonable numbers in September and October each year, only to suffer almost total decimation in the subsequent months (the only signs left being scattered wing and leg fragments on the floor). A wren was certainly responsible at one Penmanshiel site, caught red-beaked on camera. Avian predation is most likely to be the cause of other significant mid-winter declines in Herald numbers we see (bats will be inactive at this time, and spiders donâ&#x20AC;&#x2122;t have that big an appetite). Despite this, it is encouraging to see good numbers return to these same sites the following autumn, albeit to make the same fatal mistake. Populations of this robust little moth can seemingly cope with overwintering disasters. Now what? As I write the first Heralds are turning up in moth-ers light traps. Winter is over. I’m ever hopeful that I’ll be able to follow both Heralds and Tissues through the non-hibernating parts of their life cycles though this is proving trickier than I thought. And in August, no doubt I’ll be lurking around the usual dark haunts eager to see the next generation of Tissues turn up. It seems something new/exciting/unexpected happens with just enough frequency to keep me coming back for more. Emperors and Green Oranges Iain Cowe Butterfly recording sounds like fun, and it can be whilst perhaps sat in the garden or strolling in the local park, however not all Butterfly species appreciate these hospitably pleasant habitats and prefer instead to rough it, being found in the most far flung spots imaginable with few waymarked paths or restful benches or Pie shops for that matter in sight for the lonely, weary and famished Lepidopterist. So why anyone would wish to stumble many miles on foot, with few supplies for a chance to see an insect that may or may not be found is very hard to explain. Each April three particular species are upmost on my mind, two Butterflies and a magnificent day flying Moth. The first of these species is the Orange-tip butterfly. The essence of spring, found gallivanting back and forth along the riverbanks and hedgerows, pausing only to briefly refuel or inspect a suspect roosting female. The Orange-tip â&#x20AC;&#x153;canâ&#x20AC;? be seen whilst sitting in the garden or strolling through the park, however, the beauty of this butterfly can best be appreciated among the Garlics, Lesser Celandine and Forget me nots strewn along the wooded banks of streams and rivers. At about the same time of the season that the Orange-tip emerge it can be almost guaranteed that the Emperor Moths and Green Hairstreaks will be on the wing. Despite these species being both larger than life characters, they can easily be missed. The by Green Hairstreak appears as a tiny metallic green triangle, perched on a Bracken leaf skeleton, or nearby tree or shrub branch on a sunny hillside or forest edge. You see it…then it’s gone…however…with patience the Green Hairstreaks strong territorial behaviour will always mean that it will return once it has seen off its invisible territorial infiltrator, which could have been a Bird a Bee, or another Green Hairstreak. This fast and furious lifestyle can be almost impossible to follow and requires the observer to get down very low and immerse oneself within the environment. Last year I summoned the will to visit a newly discovered Berwickshire site at Soutra on the very northern edge of the Scottish Borders. I got off a bus on the A68 and had a long climb up through Soutra Aisle, then up towards Dun Law following a forestry strip track back towards the A68. The site was sheltered and open, jammed between electric pylons and thick forestry, with the droning whirr of Wind turbines on the nearby moor. This looked like a very unlikely and unattractive spot, yet I could clearly see the Butterfly food plant, Bilberry among the tussocky moorland grass. I kept the faith and did not waiver, and after an hour, out of the corner of my eye, the familiar darting flurry of a small insect dashed from a Pine, then back, circling and landing a few feet away. The sight of a Green Hairstreak can make my heart skip a beat, but like anything good in life, you only ever want more…so I was determined to find more….and I did. I chased and shadowed a half dozen Greenstreaks around for a long period, while the sun appeared and disappeared offering me at times some very close up views. I had long forgotten the obstacle course of barbed wire and rough ground I had to contend with to get here, and had completely forgotten what an unattractive habitat it was. Meanwhile, whilst concentrating on the Green Hairstreaks I had deployed my Emperor Moth pheromone lure, a small rubber bung impregnated with female pheromone that can be very successful at attracting males. I had not held out much hope on that day as the cloud was quickly encroaching and bringing the temperature way down into single figures. The Hairstreaks were by now less active yet still managing bursts of action when the sun shone. The first Emperor appeared over the Forestry canopy like a small bird, circling the area, attracted by the lure, then another Emperor skating low over the tussock grass towards me. The Green Hairstreak attempted to intercept the Emperors on their way in, unsuccessfully. The Emperors were far too busy tracking down the source of the pheromone to worry about those tiny green missiles spinning around them. I put the lures away upon attracting a few males as I know the residual pheromone can still attract the Moths long after the pheromone has been boxed and bagged. I also feel that itâ&#x20AC;&#x2122;s unnecessary to prolong a luring session as those Moths need to conserve energy for the real thing rather than be delayed in their mission to find an actual female. Of all three species, the Orange-tip is by far the easiest to find and photograph, the Green Hairstreak is easy enough and only restricted by its ,at times, difficult habitat. The Emperor Moth however is a very different kettle of fish. Itâ&#x20AC;&#x2122;s a high energy insect that when warmed up will just keep going no matter what and needs a period of cooling before it can be viewed up close. Cool sunny days with some cloud to drop the temperature are near perfect days to go looking for them. The Emperors once cooled take quite some time to start up the engines again, and in that time photographs are possible. Seeing all three of these species in one day is a rare treat that only occurs once or twice a year for me. All three should be airborne before April is out. Meet at 10.00am at Chapel Mains Farm House, Blainslie, TD1 2PN (NT559424). This is just to the west of the A68 about halfway between Earlston and Lauder. We will start with "last night's moths" trapped in the well-wooded garden and follow this with an indoor butterfly and bee ID workshop. This is aimed at beginners or those new to recording and we'll then go on a guided walk looking at butterflies, bees and wildflowers in the surrounding habitats. Tea, coffee and cake provided but please bring some lunch and suitable outdoor walking shoes/clothing/sun cream if appropriate (letâ&#x20AC;&#x2122;s hope so!) For further details and to book a place (workshop space is limited) please contact Apithanny Bourne chair@eastscotland-butterflies.org.uk . Many of the outings include the Northern Brown Argus as a target species. We are currently working on a comprehensive survey of this butterfly across the Borders and the sites being visited are ideal for learning about its habitat requirements and how to identify the adult and search for eggs (which can be done whatever the weather). A short walk organised by the Scottish Wildlife Trust Central Borders Group. Meet at St. Dunstans car park (Health Centre) Melrose (TD6 9RX) at 1:30 pm to organise car share or at the reserve at 2.00 pm. The vehicle entrance to the reserve is on the left-hand side of the A7 two miles south of Selkirk (just after the large TV mast) at NT466242. A walk of 1 to 2 miles during which we will visit the Hare Moss hide and surrounding areas to see a variety of birds, wild flowers and insects. Given fine weather a good variety of grassland butterflies and day-flying moths, including Northern Brown Argus and Narrowbordered Five-spot Burnet moth should be on the wing as will several species of damselfly. Wear stout shoes or boots and clothing to match the weather. Finish 4.30 pm. Contact: Alison Smith (walk leader) on 01896 754082. Spring shorts After several winter egg searches for the White-letter Hairstreak, the Butterfly was confirmed to have bred at Kelso, Coldstream (Lennel) and a newly discovered site at Kale Water including several new sites in North Northumberland. Orange-tip was confirmed to be on the wing on the coast at Burnmouth this year on March 31st along with Small White. Speckled Wood was observed on the Whiteadder banks on the same day. Green-veined White was seen on the 9th of April. Peacock and Comma reports have been steady, though Small Tortoiseshell continues to struggle. Keep an eye out this spring for the elusive Holly Blue that may well be on the wing now in the Scottish Borders. There were 2 sightings last year from Coldingham (Berwickshire) and Eckford (Roxburghshire) on the same day 15th August 2018. Many thanks to all contributors, recorders and supporters. Very much looking forward to hearing from you this coming season. Bi annual newsletter for Butterfly Conservation sub group for the Scottish Borders, by Iain Cowe.